CobiNet stands for above average quality. We ensure this level of high quality by performing constant tests and independent certifications. You can rely on the quality of our products. 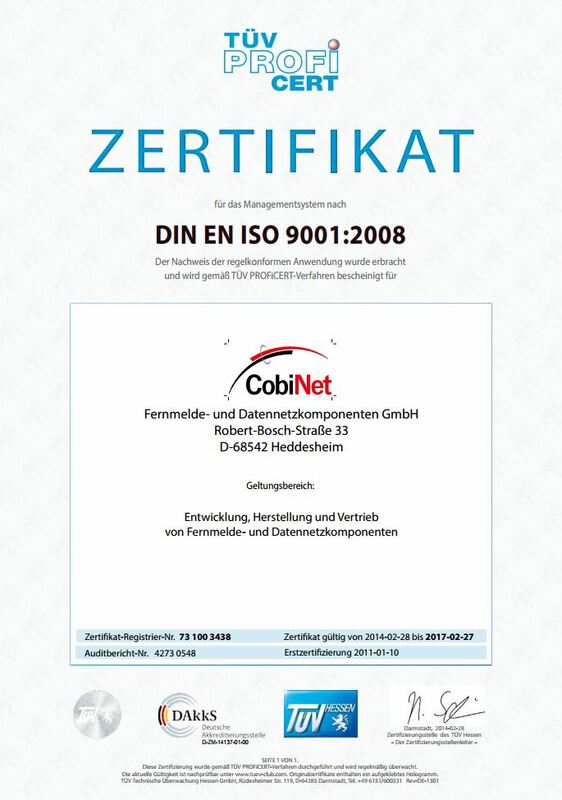 CobiNet attach importance to high quality material, tools, machinery and knowledge of our employees. To satisfy our high requirements we perform running tests in our own test laboratory. All measured values are summarized in our protocols. Our demands to all of our products: a high level of performance, reliability, a time-saving and user-friendly installation as well as a clever connection technology. That´s why independent testing institutions certify them. Our quality management system is certified by TÜV Hessen as an independent institution according to DIN EN ISO 9001:2008. Our Keystone CobiDat KS is validated by the markets most effective quality valuation program. The accredited testing laboratory according to DIN EN ISO/IEC 17025 continually chooses unannounced product samples out of production, warehouse and from distributors to check national and international compliance with guidelines. 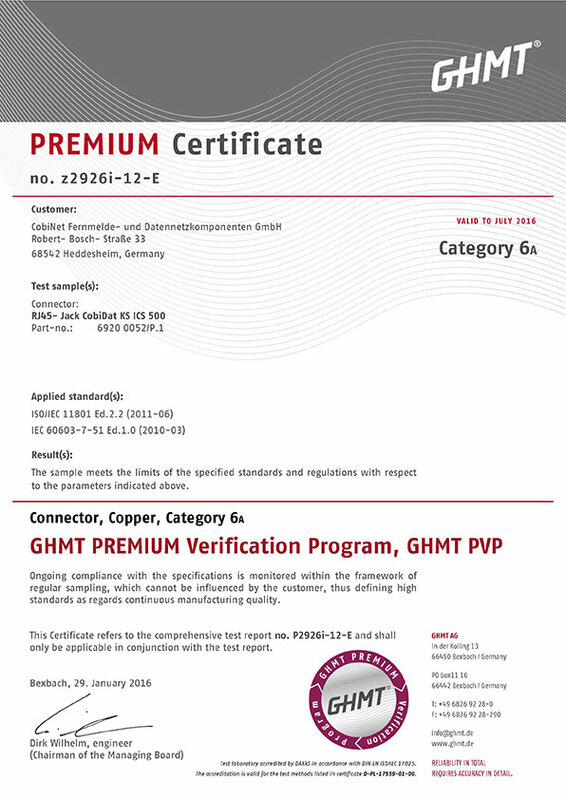 Our consistent high quality is certified with a Premium certification and a test report. The current status is available on daily basis. Association for industries and professions of electrical engineering and information technology. An international expert platform for science, standardization and product testing – interdisciplinary, closely connected and unique. DKE Deutsche Kommission Elektrotechnik Informationstechnik in DIN und VDE is a modern, charitable service organization for safe and efficient production, distribution and use of electricity and a benefit for the community.